The 2nd Active Nonviolence International Film Festival (FICNOVA) has awarded special prizes to five productions from different countries. FICNOVA is organised by volunteer teams of World without Wars and Violence, an international organisation of the Humanist Movement, together with other humanist organisations, groups and individuals who share the same purpose of advancing in the development of nonviolence. A polycentric festival took place in 12 cities in six countries (Canada, Mexico, Guatemala, Brazil, Mauritania and Spain) in this second edition of the contest. The different organising teams in each city that took part counted on the collaboration of educators and professionals related to cinema when choosing the 16 finalists from among all the entries that came from Burkina Faso to Argentina, via Spain, Canada, the USA, Mexico, Guatemala and Nicaragua; and finally when selecting the five winning films in the various sections and categories. In this year’s awards, in the General Section recognition was given to films showing nonviolent demonstration effects: the Argentinean feature length film “Pachakuti 2012. The Change” by director Carlos Santos with a story of the experience in Isla del Sol in 2012 showing the profound transformations driven by indigenous people; the Canadian/Nicaraguan short film “At home, in bed and on the street” by director Liz Miller in which the experience of rebellion is shown in the face of gender discrimination and violence using the mass media; the Guatemalan short film, “Ri´ka raibal ixoqi¨ – Our body-earth territory in liberty” directed by the Guatemala National Union of Women, as a valuable show of global change embodied by these Guatemalan women. 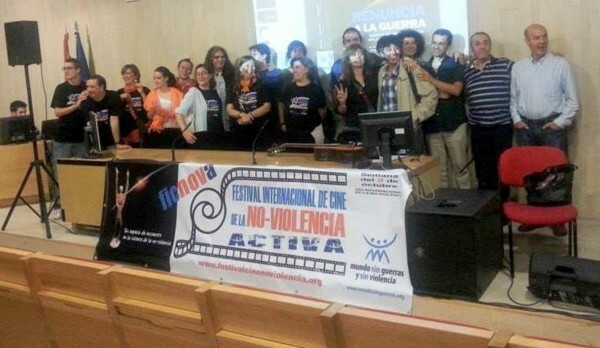 In the section of Education Centre awards were given to the Spanish short film “Difficult Decisions” by the Trama Centre Association and to the Mexican mini film “No more violence” by the young director Nicolás López Maya in which the creativity of students is shown in denouncing the psychological violence in the classroom. As we have seen, despite the poisonous social atmosphere of cruelty in which we move, within many human beings something new is growing, something that requires internal agreement and not betrayal of oneself. This moral attitude that leads us to a coherent behaviour with oneself and with others is expressed through necessity in the world with nonviolence. In increasing numbers of places we find these examples of internal and external change which many human beings are aiming for. The festival aims to show them in order to help create a global nonviolent consciousness. In this regard, FICNOVA launched its signal with strength in the week of the 2nd of October, the International Day of Nonviolence as declared by the United Nations, marking Gandhi’s birthday. But it didn’t only show films from around the world in that week, but rather it encouraged, with the help of those producers who allow it, that anyone can come to see these examples and so that meeting points and places for interchange of experiences may be created, in which we can advance in a double path. So, from the base teams of World without Wars we work throughout the year sharing the experience and tools generated by New Humanism with anyone who is interested. We have already started to prepare the next edition so that, with everyone’s help and through what we’ve learnt this time, we may manage to give a stronger signal next year. Nonviolence is not a simple idea, or a mere strategy for struggle in order to gain external results; nonviolence starts from the moving experience of recognition of something great within oneself and in others which should be cared for; something which is capable of connecting with the best and most profound purposes in our action in the world.